Traditions are cool. They are something you look forward to experiencing every year. They make life more interesting and exciting. For many years I was blessed to be able to sponsor a little boy, Hussen, in Ethiopia with two of my friends through World Vision. It was one of the best things that I have ever done in my life. One tradition that I have also done for several years at Christmas time is to pick out a gift through the World Vision Gift catalog to help those in need. I’ve given to the clean water fund, given emergency food and aid to children in Africa, and given seeds for a family. However, the one gift that I have longed to purchase for several years is a goat, which I planned to buy once I got married and had children. I desire to show my (future) children the importance of giving and helping those in need. My heart especially goes out to people and children in third world countries, especially after my mission trip to Haiti. This year I decided instead of waiting for the future (i.e. marriage and children), I want to make a difference as a single woman and buy a goat now. While not prosperous by any stretch of the imagination by American standards, I would rather stretch my income and bless a family in another country with a goat for $75 than use that money in a more self-centered way. If you would also like to help people in need through Word Vision but you are looking for more affordable gift options, several affordable options are 3 ducks for $21, art and music instruction for $20, and a share of a donkey to take produce, firewood, and goods to market for $25. You can also help children specifically in America by feeding a family of 5 for a day for $18 or buying $250 worth of necessities for urgently needed clothes and shoes for kids in America for only $25. You can go online 24 hours a day to check out +/or purchase a gift for someone in need. Go to www.worldvisiongifts.org. They also have a mailing option to send checks, or you can call 1-888-511-6511 (Monday-Friday 6 AM- 9 PM and Saturday 6 AM- 6 PM PST). Facts about World Vision: “World Vision is a Christian humanitarian organization dedicated to working with children, families, and their communities worldwide to reach their full potential by tackling the causes of poverty and injustice.” They serve nearly 100 countries and “provide emergency assistance to children and families affected by natural disasters and civil conflict, work with communities to develop long-term solutions to alleviate poverty, and advocate for justice on behalf of the poor.” (http://www.worldvision.org/about-us/who-we-are). In order to be resourceful at work and last through the day, I first tried to repair my shoe using packing tape and velcro sticky fasteners (that seemed past their prime), but those solutions did not last more than a few minutes, and unfortunately my morning walk got postponed. My third solution was duct tape, but since the base and side of my shoe were very slick, the shoe did not bond well with the duct tape. 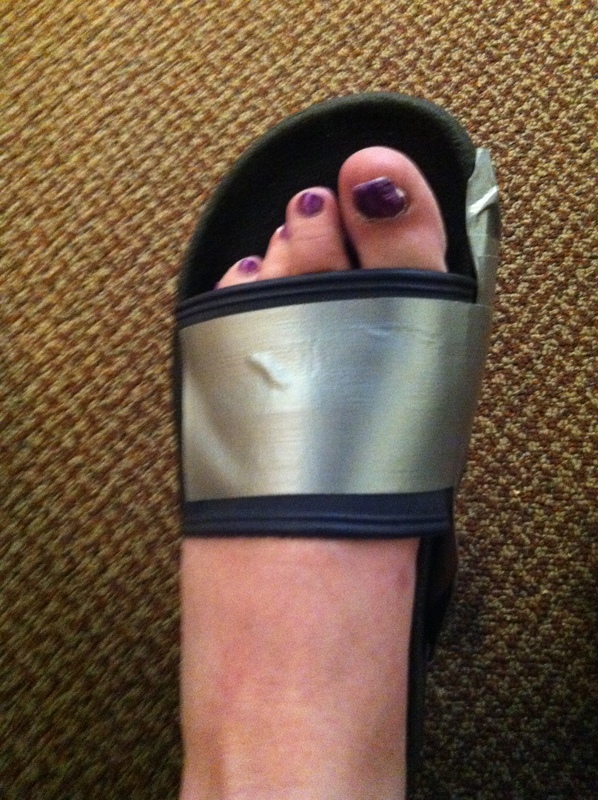 Thus, duct tape was not the solution that I had hoped for. But at least the duct tape helped my shoe limp along until my lunch break, when I resigned myself to racing home to get a different pair of shoes. Honestly, I wasn’t sure that my shoe would last through the day, and I didn’t want to “push my luck” when I had to more mobile at work later in the day. Also, I wasn’t too keen on wearing my “ghetto shoes” to a meeting with an Associate Dean and co-workers that I had in the afternoon. I wonder if duct tape is considered fashionable? Here is a picture for you to decide. The one really good thing was that the whole situation made me think about deeper issues than just the loss of my shoe and embarrassment of my duct tape solution. It made me think of all the children around the world who do not have even ONE pair of shoes to wear. Besides being unsafe if children walk without shoes through briars, stumble upon broken glass, or encounter other sharp objects, I am sure that being without shoes is also a health risk in terms of hygiene. No child or adult should be deprived of clothing or shoes, as well as basic necessities of life such as water, food, or shelter. It is sad the basic necessities, as well as luxuries, that many of us in developed nations take for granted. When is the last time you had to wonder if you had shoes to wear or if your water was unclean? I was blessed to go on a short-term mission trip to Haiti when I graduated from college, and it forever changed me. I worked as a teacher’s aide in a second grade classroom at a Christian school. While in Haiti, I saw poverty like I never had before, and it opened my eyes to the wealth and privilege that I had in the United States of America. It made me want to help, and while sometimes it seems that I can’t do as much as I’d like due to my limited resources and finances, I am confident that every bit helps. Today, when I thought of children without shoes, it made me think of Tom’s shoes, a business that cares to help needy children get shoes, as well as charities like Shoes for Orphan Souls.